Last year, more than a million refugees made the dangerous journey over both land and sea to reach Europe according to statistics by the International Organization for Migration. Desperate to escape conflict in their homelands, thousands have tragically lost their lives on the journey. In the countries that receive them, international humanitarian groups, like the Red Cross, are hard at work trying to provide relief to this massive influx, but they face a number of challenges. On Thursday February 25, 2016 the Greater New York Red Cross hosted a panel to discuss these challenges and find a way forward. 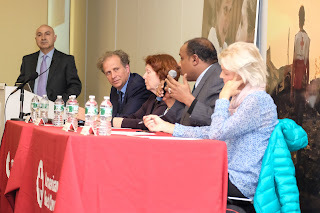 Moderated by CUNY professor of sociology Dr. Mehdi Bozorgmehr, the panel’s members included Ashraf El Nour, Permanent Observer of the International Organization for Migration (IOM) to the UN; Mary Jo Frawley, field nurse for Doctors Without Borders; Philip Spoerri, Permanent Observer of the International Committee of the Red Cross (ICRC) to the UN; and Joan Timoney, Senior Director of Advocacy and External Relations of the Women's Refugee Commission. 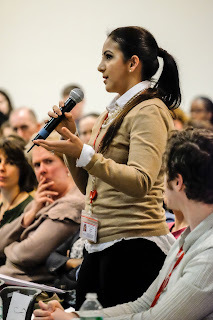 Speaking to a packed auditorium of 200+ Red Cross volunteers and other internationally-minded New Yorkers, each panel member shared their own unique perspective on the current crisis. Ms. Timoney highlighted the plight women and children making the perilous journey and offered practical advice to provide them with better protection. Mr. Spoerri discussed the work of the Global Red Cross Network in countries of origin and in Europe emphasizing that more than 90 percent of current migrants are fleeing against their will. Mr. Nour described the magnitude of the conflicts refugees are fleeing from namely Syria, where the population has been displaced by fighting. Finally, Ms. Frawley described her work providing medical care to refugees on the MOAS, an offshore aid station in the Mediterranean. In a first for our chapter, the conversation was live-streamed on YouTube. If you’re interested in learning more, you can watch an archive of the stream here.